A blood drive for faculty and staff at Syracuse University is expected to take blood drive numbers to a whole new level as part of the annual “Are you up for the challenge? : Give Blood” competition between Syracuse University and the University of Connecticut. The faculty and staff drive, co-sponsored by the Division of Student Affairs and the Office of Academic Affairs, takes place Tuesday, April 26, at Archbold’s Flanagan Gymnasium, from 11:30 a.m.-4:30 p.m. To make an appointment, contact Meghan Toomey at metoomey@syr.edu or 443-5013. With two drives remaining, SU is just 90 units shy of its goal of 444 units to beat UConn. The final campuswide drive is scheduled for Wednesday, April 27, at Haven Hall from noon-5 p.m.
Each pint of blood can help save three lives. SU blood drives have helped save more than 100,000 lives since the partnership began 40 years ago. The SU vs. UConn Blood Battle was initiated by the Connecticut and New York-Penn American Red Cross offices in 2009-10 in an effort to increase blood donations at college campuses. The SU vs. UConn Battle was patterned after the Ohio State vs. Michigan Blood Battle, which began in 2004. UConn won the challenge last year, collecting 501 April units with an enrollment of 16,998 for a winning ratio of 2.95 percent. SU collected 208 April units with an enrollment of 12,491 for a participation ratio of 1.66 percent. To win this year, SU students, faculty and staff need to collect 438 units of blood in April for a participation rate of 3.10 percent. Not everyone is eligible to donate blood, and blood donation is not the only way to support this event. 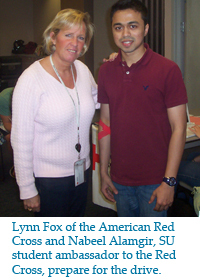 If you are interested in volunteering to support the effort, in lieu of donating blood, contact Lynne Fox at foxlynn@usa.redcross.org. All potential donors go through a screening process. To find out more about donor eligibility, visit: http://www.redcrossblood.org/donating-blood/eligibility-requirements, or call 866-236-3276.